The much-loved chocolate filled Drumstick ice-cream cones were invented in Brisbane and the ice-cream factory, which is now 89 years old, still stands in the inner city. 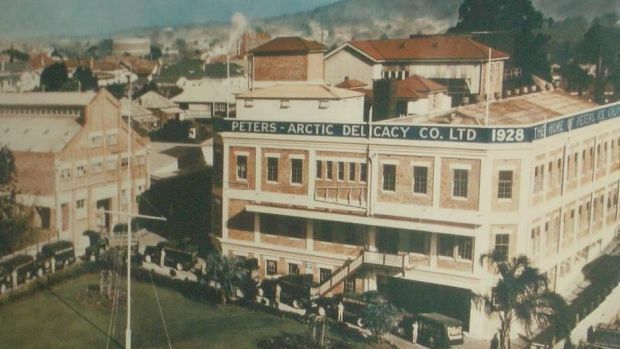 Peters Ice Cream factory at West End was built in 1928, a time before modern refrigeration technology. An ice-cream factory without proper refrigeration meant salt water was used to lower the temperature of the water that would then freeze the ice-cream. The West End factory, which stopped operating in 1995 and now has a place in the future $800 million West Village development, will open its doors to Brisbane for one last Open House before construction work begins in 2018. West Village project director Andrew Thompson said the building on the corner of Boundary and Mollison streets is the original building that was built 89 years ago. “This building, which is where they made the ice-cream, it has all the stainless steel around the columns and the draining in the floor as well as the building across the laneway, which is where they made the ice-cream cones,” he said. “The Drumstick, which everyone loves, the chocolate bit at the bottom was actually an invention that occurred in this factory where they had a problem with leaky ice cream cones. The Peters Ice Cream factory is just one of more than 90 venues around Brisbane to take part in the 2017 Open House weekend on October 7 and 8. Brisbane Open House, now in its eighth year, invites people to explore the city and see how it has evolved. Queensland government architect and chair of Brisbane Open House Malcolm Middleton said the event was so successful because they just keep finding things. “People keep bringing projects to us and there’s always new work happening and some very good new work and we really like to showcase new work,” he said. What started as a one-day event with 30 open sites has now evolved into a weekend, but Mr Middleton ruled out the free event extending much longer. “I don’t think we would be able to sustain the volunteer side of things and for the building owners to be more than a weekend,” he said. Brisbane Open House attracted more than 68,000 visitors to more than 90 buildings in 2016. State Heritage Protection Minister Steven Miles said 49 of the buildings in the 2017 program were heritage-listed and many were not usually open to the public. “Popular drawcards are likely to be the historic Parliament House and Government House, as well as the newer buildings such as the 1 William Street tower and the Translational Research Institute,” he said.